Keawe Adventures – Page 3 – A day in the life of Keawe Adventures! Discover new updates to our tour offerings, photos from some spectacular sights we see around the island, and a random assortment of things we do all day. — Call us or email to book: 808-780-1253 or keaweadventures.com. Should we pick up a turkey or a ham? Well, on the day before thanksgiving Keawe Adventures decided to add another item to the menu. Ham, turkey, mashed potatoes, cranberry sauce, stuffing, and Oio, a local Hawaiian delicacy. Bringing Oio to the dinner table changes the norm of a traditional Thanksgiving and adds to the Hawaii spirit of having all your loved ones together to celebrate how fortunate we are. With a camera crew in hand, well more like a GoPro operator, we stalked along the sandy, shallow coastline of Oahu’s South Shore, with a net in hand, in search of the elusive Oio. With the right tide and depth, we were gifted with one 8lb Oio and another 7lb Oio in 30 minutes. This is enough fish to feed the masses, and a usual Thanksgiving in Hawaii can bring in 10 to 20 people easily, the more the merrier. A ton of people and plenty of food to share with your closest friends and family. Life is short, spend time with your loved ones and be safe this holiday season. From the Keawe Adventures family to yours, Happy Holidays. To start I’m the new intern here at Keawe Adventures! My name is Rebecca and I have been in Hawaii for about 2 years now. For a big city girl from Texas, Hawaii is a big change but an incredibly inspiring one. I spent the first 19 years of my life here and there with a very dedicated father in the military and then ended up here for my last two years of college. I’ll be graduating soon but wanted to have something on my resume that shouted adventure and experience. I mean what better way to do that than by actually having the word Adventure in there, am I right? I came into this industry not really knowing anything about tourism or hospitality and to say I was hungry to learn is an understatement. So, I applied for this internship hoping for something new, and boy did I get something new! I have to do 400 hours of my internship and I’m so excited to have the opportunity to do that here. This will just be a fun way to document my time at Keawe Adventures. As for my first official day ‘on the job’ I learned more about fish, fishing, and the fishing community in three hours than I have in my whole 21 years of life. I feel like I’m going to be learning a little bit of everything with my time here. I came into work this morning at 6:30 with my venti Starbucks coffee in hand. I’m definitely not a morning person however I was really excited to start my internship adventure. I was expecting to sit at a computer, answering phone calls and spending the day in an office, but let me be the first to tell you guys, that was not the case. As soon as I walked in Makani, the owner of Keawe Adventures, was ready to go! He told me that we were going to be spending the morning “taking people fish”. Now being the naive city girl I am I assumed we were taking frozen fish, or already cooked fish to friends, and while half of that is true (everyone we took these fish to were friends) the fish was definitely not frozen or cooked. It was fresh. Like from the ocean, probably was alive 24 hours ago or less, fresh. I’ve never seen a real fish, because in Dallas about the closest thing we get to fresh live fish is a cow, so this was a real eye opener! The first place we went to was a concierge friend of Makani to drop off some fresh fish he had caught. 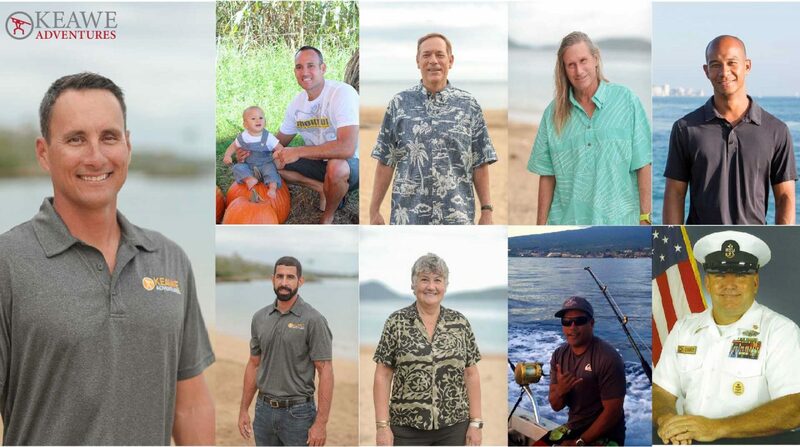 Keawe adventures is so appreciative of the relationships they have built with the local community and so far I’m learning just how to spread the Aloha Spirit and be thankful to all the people who make this industry successful. Anyways after, we went to the fish market to really open my eyes to what the fishing business is truly like. (Pictured above and below) I can honestly say I have never seen so many fish in one place. Like, what? This is actually a thing! Honestly, I felt like a fish out of water. But overall it was so cool to see all of the fish and to see all the fisherman interact. Relationships are so important in this industry and being able to gift someone with fish and even just make connections with fishermen is priceless. After the large scale fish adventure, we headed over to a small pier where Makani met with his friends who had just returned from fishing. Man did they have a lot of fish! The boat seemed so small but the amount of fish they had was a ton! Literally! They were all so nice and they worked so hard for all the fish they had caught! Two whole days of fishing, but you know what they say hard work really does pay off. They were kind enough to give Makani some more fish and instead of just keeping it he decided to pay it forward and go to more concierges with gifts of fish! It was so much fun and everyone was so appreciative! Overall today was great although I’ll be the first to admit, I’m not a morning person, I might need to start because look how productive we were, and mind you this was all before 9am! I can’t wait to see what this next few months has in store for me and Keawe Adventures. And don’t worry, I’ll keep you all posted on what this new chapter brings. Most people hear the word ‘intern’ and immediately think of mundane paperwork, cubicles, and following strict orders without question from their demanding, impatient boss. However, Keawe Adventures blows every one of these stereotypes out of the water. My first day as an intern with this company consisted learning real life lessons applicable to living and working on a Hawaiian island and exploring Oahu’s North Shore with a client firsthand. As I was letting my mind wander, I gazed out into the ocean and at all of the surfers as they gracefully rode each wave with ease. I found myself desperately wishing I had the audacity to even jump in the water, instead of being held back by my incessant nerves. As if Makani was reading my mind, he looks at me, and says firmly, “Alright, your turn, we’re going in the water.” This was not a question, but a matter-of-fact statement. If anything was going to get me to swim in North Shore’s waves during winter, it was a direct order from my boss on my first day as an intern. I quickly jumped up, and said “Ok, just keep me alive!” and ran out into the water before I had enough time to change my mind. I had never come close to swimming in waves as big or as powerful as these, but with Makani’s guidance, I went from being terrified, to determined, to actually enjoying myself and diving under waves with my fear of being tumbled, pulled out by the current, or drowned almost diminished. Makani taught me how to always dive under the waves right before they hit and that the sand is there for you to grab if you must. I learned to never turn my back to a wave, and to most importantly, to stay out of the surfers’ way. Every wave, my fear lessened, as I applied Makani’s advice and dove confidently under each one, grabbed the sand, and listened safely from below as the waves crash down on top of me. As I emerged from the water twenty minutes later with my throat, eyes and nose stinging from salt water, and about a pound of sand in my hair and bathing suit, I had seldom felt so accomplished. That day marked the beginning of me finally understanding and appreciating the power of the ocean, instead of fearing it. That will forever be the first and I believe, one of the most important lessons I have learned as an intern at Keawe Adventures. After a few more minutes relaxing on the beach, we decided to head back to the client’s hotel to grab some dinner and catch the sunset. I felt as if I was with a group of friends deciding what do with their night, instead of it being a business/client relationship. It then dawned on me that this is why Makani and his company are so successful. He does not treat his clients as customers, but rather as old friends. It is because of this that his job so enjoyable for him and everyone involved, and keeps the clients comfortable, and wanting to return – which is the key to a successful business. We pulled up to the Turtle Bay Resort just as the sun was beginning to set and all sat down at the restaurant by the beach, exhausted but fulfilled from the sun and ocean filled day. As the day turned slowly into night, we ate our delicious, well-deserved dinner, reminisced on the day’s adventures, and I could not help but feel like the luckiest intern in the world. I spent my first day surrounded by the real Hawaiian landscape, the ocean, sunshine, great company, and I learned how to keep myself alive amongst the North Shore’s infamous waves. You can’t learn that from a cubicle. New adventures everyday! We’ve had quite a bit of rain in Hawaii lately, so the mountain streams have been flowing. Waterfalls hikes are just one way to enjoy a day outdoors on Oahu! Taking a moment today to remember the tragic events of September 11, fourteen years ago today. Photo taken from the USS Arizona Memorial at Pearl Harbor. Even though we live in a tropical paradise, every once and a while it does rain in Hawaii…This week has been one of those times, and with a potential tropical storm passing by, the island of Oahu got pounded with several inches of rain overnight. But when you’re with Keawe Adventures, you needn’t worry! There is fun to be had no matter what the weather is like. This week, during a brief break in the rain, we headed to Maunalua Bay, formerly one of the richest food production areas of ancient Oahu. In the bay, several mountain streams empty into the ocean during heavy rains, creating pockets of nutrient rich, murky water, which draw the fish in closer to investigate. So we seized the opportunity, and went out for a wade in the stormy seas! Throw-netting is an ancient style of Hawaiian fishing, rarely seen practiced in the bustling metropolis of Honolulu today. It requires a very specialized knowledge, including knowledge of the fish habits and habitats. Makani was lucky to have been taught as a kid growing up on the Big Island. I had never been throw-netting before, so for me this was mostly a watch-and-learn experience. Wading around in the knee-deep brackish water, with storm clouds brewing above us, we patiently waited for the fish appear. According to Makani, when the water is murky with rain-runoff, the fish will swim right up to the sandbar at the mouth of the stream. After a half hour with only one sighting, I was beginning to wonder if this was true after all…until Makani adjusted the weighted net looped over his shoulder, took a swing, and heaved the net into the onshore winds, encircling the spot where he had seen a silver flash. Seconds passed with no result, until a thrashing splash indicated the throw was a success! He reached down and pulled a 7-pound bonefish (known as o’io in Hawaiian) out of the water and carefully freed it from the net. After the excitement of the catch settled down, Makani began to explain the proper way to care for the freshly caught fish. We put the fish in a mesh bag, and left it in the water while we kept fishing. He emphasized the importance of keeping the fish alive until it can be brined and put straight in the cooler, otherwise you risk the meat spoiling in just a day or two—wasting resources and what could have been a good meal. After twenty more minutes of wading around trying to spot bonefish, we switched it up and went fly-fishing for a bit. Although not usually known as a fly-fishing destination, the sport is growing in popularity in Hawaii as a way to catch bonefish, with the fly imitating a tiny mantis shrimp. Fly-fishing is another sport requiring patience and a decent chunk of time…but after a half hour with no bites, we went back to throw-netting. Walking down the beach to a new location, Makani taught me how to spot the turbulence on the surface of the water indicating mullet fish below the surface. With light winds blowing, it can be tricky to see, and several times I thought maybe I was just imagining things. But he set off wading slowly into the water, and waited for a patch of “nervous water” to come his way. Eventually a disturbance came by, and once again he swung and threw the net out in a wide loop around the spot. After a moment I saw him dive his arms down into the water, indicating another successful throw! He came up with a mullet, and waded back to shore for a photo op and to add it to the bag with the bonefish.